Being alone at home has its pros & cons. The good thing about it is that the house becomes less noisy & nobody distracts you from doing your own thing. The bad, however, is you're left to take care of your own meals all the more if you're a grown up. Grandpa's car was available & I could easily drive out anytime to buy lunch. But the terrifying thought of getting stucked in jams & no luck in finding a parking on a scorching hot day is more than enough to keep myself glued at home. 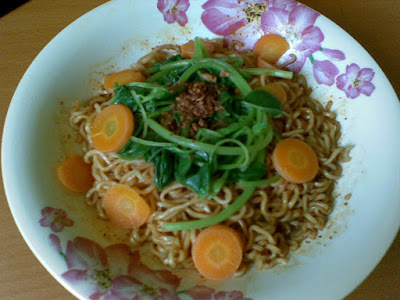 Now says who that instant noodles are unhealthy? It can be another balance meal when cooked properly.